I love Tom Colicchio, and probably always will. Tom and his restaurant Gramercy Tavern were both very pivotal in my transmutation from a guy who loved food and wine, to a guy who may think about food and wine a little too much. "Think Like a Chef" was the first cookbook I ever read cover to cover like a novel, and while I was doing it I would lunch at Gramercy, allowing me to get a real feel for what I would be doing at home later on. Tom also commands my adoration because he has done a good deal to draw attention to the better quality of food from local green markets. Tom is an ardent advocate that the best way to elevate the quality of your food is to elevate the quality of your ingredients. Rather than preaching about local, small grown product being karmically better for the next generation and us in every way (which seems obvious, yet few seem to care) he has simply made the case that, in their season, all foods taste better so why even try to eat them out of season. I do not love Craft, and that is probably Tom's fault. 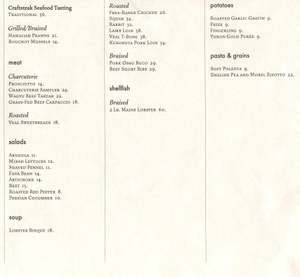 Although all the food I have ever had at Craft has been truly exceptional, the idea makes little sense to me. The truth is, thanks in a large part to Tom, I am a pretty good cook now. I consider meal preparation a great way to pass time, searching out great ingredients and taking the time to properly roast, braise, or whatever them. I know for a vast group of people this is not true but, since it is for me, when I go to a restaurant I go to see what imaginative new things the chef is doing or pairing, looking for that inspiration rather than obliging them to simply be better at cooking than I. So a restaurant whose mission is "we will cook it perfectly, you decide how to put it together," just isn't my idea of fun. I go to a restaurant to completely put myself in the chef's hands. Last night Craft Steak opened to the public, so again I found myself eating from the hands of Chef Colicchio. 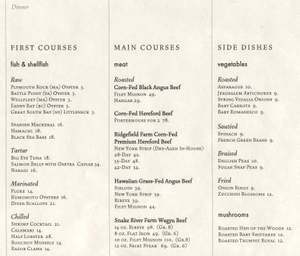 It is in that part of town I used to call Chelsea but now call No-Such-Thing since restaurants publicists like to call it No-Meat (although at this point it may be Juggernautonia) on the Del Posto side of 10th Avenue at 15th street. I really appreciated the design; it is just a very cool, very big room. What I am sure would be called banquettes are really more moon-shaped couches with a great line. Separating the bar from the dining room is a glass wine hall. There are very sleek individual steel pipes with softened white cylindrical lights which are grouped to make chandeliers. Everything sleekly flows to a huge mural of the block you are on, painted from a bird's-eye view. I feel at this point it is important to make a difference between a steak house (chop shop), and steak restaurant (meat-focused fare). Steak houses do one thing perfectly, and usually tend to do nothing else well (think Luger's watery, huge shrimp or crunchy tomatoes that taste like plastic till you pour a catsup-based sauce on them. Really. Catsup. On a tomato. Say that out loud and think about it). A steak restaurant is more like a seafood restaurant. They make various dishes in various preparations of a similar origin. Waiters in a steak house do their job well when they keep you from making the huge mistake of ordering the non-house special; waiters in a steak restaurant help you choose wine and are aware that there are at least four more preparations for spinach than creamed. The staff looked great in their first-night crisp peppermint-striped shirts under black vests with ties. It is probably more a testament to our server's talent than anything else, but when I think back on the room I think of dimness though when I recall Allison she is well lit. Either she really was as enthusiastic to be up and running as she seemed, or the adroit design has taken focused area lighting to new levels. Steak is the opportunity to drink Bordeaux, an opportunity I tend to like to take advantage of. My companion this eve was Fittsdoola. He and I had taken ownership of some '95 Pichon Baron earlier this year and we concur that it is a nice Claret and were therefore very happy to see it on the menu. We were a little upset to see it priced $180 in view of the fact that we picked up ours through very traditional retail methods for $60 a bottle in the last fiscal quarter, making this skewed to the very high side of what is a fair price. But, traditionally, steak houses are part of the reason wine is so overpriced, it was their first night, and we really wanted to drink it. So we bought it, but agreed that going forward we would look past that one for more appropriately-priced wines, or just drink drafts of Sweet Action, possibly the best named beer in a long time. The Baron drank very well, with raspberries dominating the standard Left Bank profile. Fittsdoola felt it was almost Rhone-ish in its cinnamon and earth notes, perfect with the ensuing meal. No food service is more à la carte then steak, and therefore what is lost on me at Craft is genius at Craftsteak. A huge selection of raw bar items in various preparations, as well as meat selections that favor charcuterie, and eight cold vegetable preparations called salads, combine with lobster bisque to be your available starters. We decided to leave sampling these for later, in the interest of keeping things fresh, to concentrate on the restaurant's real focus: steaks. Being an inaugural run, we had popped in assuming it would be hard to get a seat and planned a short sortie just to taste some food at the bar, so we focused our eating on the right two-thirds of Craftsteak's menu, the mains and sides. The steaks are all sourced, meaning you can choose from five origins. Within these parameters you can choose cuts in the case of the Corn-fed Black Angus beef, the Corn- fed Hereford beef, the Hawaiian Grass-fed Angus Beef, and the Snake River Farm Wagyu Beef, or length of aging in the case of the Ridgefield Farm Corn-fed Premium Hereford Beef. 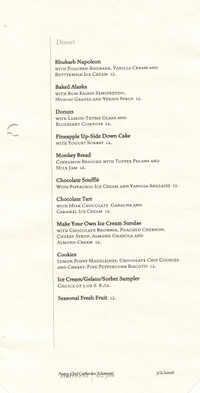 If you are with a curious epicure and someone to share with, as I was, this menu is a dream. At first we discussed getting one Ridgefield strip aged forty-two days and one aged fifty-four. We also discussed the Hereford porterhouse, before settling on the thirty-five day Ridgefield strip and the strip from Hawaii. We plan return next time for the aging vertical of Ridgefield; Craftsteak may thrive as a result of comparison eating. The truth is feeding cows corn is one of the cruelest things we do to animals in order to make them more appealing to diners. (It is far worse than foie. While ducks would naturally eat grains to fatten their livers to some point, no cow would eat a non-green item. It is literally poison to them). But I don't base my distaste for it on that, that would be hypocritical. I disagree with general corn-feeding of cows because it so bad for their health that, when done on a large scale, they need to be heavily dosed with antibiotics to keep them alive, and that is not good for us, plus most corn feeding is done because it is cheap and easier with no direction of flavor in mind. Cutting corners in the food supply is never something I support. However, on a small-scale farm done well and carefully it truly can make better tasting food and that I like. So here we were with an aged corn-fed strip steak and a grass-fed strip, cooked at the same time by the same guy, with which to compare the merits of one to the other. Because of this opportunity alone I will forever have a warm spot in my heart for Craftsteak. Both were served medium rare, sliced off the bone and then again sliced thinly across the grain in a hot dish with tarragon, chopped chives, and a roasted shallot as garnish. Both were also roasted as opposed to grilled, which I imagine will always keep Craftsteak a restaurant about meat rather than a respected steak place. Although the roasting plays more to subtle nuance of taste, the truly great steaks are grilled in my experience. As far as appearance, the grass-fed is more lean and redder; the corn-fed aged is almost whiter than red taking on an almost blue cast. As far as texture, the Wustoff steak knives are so sharp we really couldn't judge until we were chewing. In the mouth, the corn-fed is far softer; the grass-fed is more resilient than tough. As far as flavor and aroma, the corn-fed is rich, you actually feel yourself eating it more than tasting it The grass-fed is far more flavorful. Eating it was like tasting wine (by the way, we both agreed that the wine was far better with the grass-fed; the corn fed would have wanted a monster, would maybe even justify a Cali cab), there was a point where the flavor was so mineraly and saline that we decided it was most comparable to a fish like cod. Truly fun to contemplate. In the beginning, we agreed that we probably preferred the corn-fed to the grass. It was just so luxuriant. Later, we felt the grass was probably more preferable because the fun of the dinner was in the contemplation of sensations, which the grass-fed just offered more of an opportunity for. In the long run, there was some corn-fed left and no grass so we decided the proof was in the lack of pudding, and went Hawaiian. Roasted Asparagus, aggressively salted and peppered with great black bits from roasting, it was dressed in olive oil and had great crunch. I enjoyed it as did Fittsdoola, who claims not to usually. Fried Zucchini Blossoms, the flower was batter-dipped and the baby zucchini attached wasn't. Good bite, again well-salted and peppered. I may have preferred the vegetable to its petals, something that seldom happens when comparing battered and not. Roasted Potato and Garlic Gratin, good ones are good, bad ones are bad. This is a good one. Craftsteak seems to me poised to succeed where others have failed, as a steak restaurant in a town of steak houses. Those that compare it to great chop shops will probably be upset Craftsteak is a place for people that want to engage in dining not be steered through the motions. People that want to ponder while eating, not be fed. There is little doubt that great steak is a thing many people love and, as a rule, they love it simple. However this does not, mean that everyone wants a great, simple steak at the cost of a good room, good service, and good accompaniments. They just want the steak to be the most cared about component. On a cursory visit, I think this may be that place. But I'll need about 6 more jobs to be able to fill your food and bar tab. Thanks for the compliment Mike. As far as another job or five all you have to do is give up things like cars, clothes, TVs and stereos. If you can live well with all those things being at least 5 or so years old, you can eat like I do on one low paying job I’m living proof.